Saturday Woodcutter believes she is the only one of her many siblings without any magic, until the day when she throws a mirror out of the window in a rage, and conjures an ocean in the backyard. Because one of her brothers has run away and Saturday believes her ocean may have drowned him, she grabs her trusty axe (which has decided to change shape into a sword for the time being) and sets sail on her sister Thursday's pirate ship in order to try to locate him again. She's abducted by a giant bird and taken to an icy cave, towards the top of the highest mountain in the world. The blind witch there isn't actually all that skilled at magic and was attempting to kidnap Saturday's eldest brother, the adventurous Jack Woodcutter, who's the man who stole the witch's eyes in the first place. Saturday is advised to keep silent about her true identity by Peregrine, a cross-dressing young man also trapped at the top of the mountain. The witch believes him to be her daughter, after the foolish young noble accepted a wish from what he thought was a kindly fairy. The wish was in fact a curse, and it allowed the witch's daughter to escape her mountain home, forcing Peregrine to take her place instead. He's lost track of the years he's spent there, trying to foil the witch's many plots. Peregrine dreams of breaking free of the curse and going back to his betrothed, who he believes he's seen in visions through much of his time in captivity. Imagine his surprise when he realises that the fearless warrior woman he's seen in visions and dreams is in fact Saturday. Saturday, in turn, doesn't see why romance needs to have any part in her adventure, although she can't deny that she likes kissing Peregrine. To rescue him, and escape the mountain, it looks like she's going to have to kill the witch, who's dangerously close to opening a portal to a hell dimension. Of course, killing the witch may wake the slumbering dragon on the mountain top and kill them all. What's an adventurous young lady to do? It's not easy being a hero. This is a sequel to Enchanted, where we first meet the Woodcutter family, and Saturday's youngest sister Sunday falls in love with a frog prince. 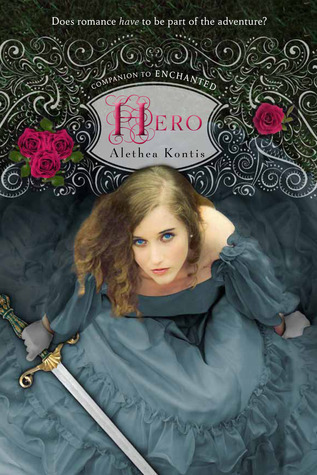 Alethea Kontis doesn't really retell just the one fairy tale, instead mixing all sorts of elements from fairy stories, mythology, folk lore and adventure stories in a blender and throwing the results together into exciting young adult fantasy stories. While Sunday's story was sweet, I think I liked Saturday's story even more, as the gender reversal of the characters in this book really appealed to me. Saturday is tall, and not particularly feminine, and comes from a family blessed with a number of magical gifts, without believing herself to have any. She's got an enchanted axe, and has been working with her woodcutter father and brother in the woods for much of her life. With a brother whose legendary for his quests and adventures, several sisters married to royalty and one who's off on the high seas being a pirate, Saturday never really imagined she'd get to leave on an exciting journey on her own. She's pragmatic and sensible, and not prone to daydreaming. She certainly never expected to find a man in a skirt, posing as a witch's assistant on the top of a mountain, confessing that he's dreamed about her since very likely decades before she was actually born. That's going to flummox the best of people. As Saturday discovers on her adventure, you don't always choose to be a hero, sometimes circumstances just force you into it. She's a great character, as is Peregrine, who is a wonderful example of a beta hero, not at all concerned with the idea that Saturday is physically stronger or a more skilled fighter than he is. The curse the witch's daughter cast on him keeps him from aging while he's trapped, and gave him a much more feminine appearance than he was born with. He's learned to adapt to his long hair (which grows back if he tries to cut it) and being forced to dress in skirts, but has hidden every mirror he can find and tries to avoid reflective surfaces. His captivity is a fairly lonely one, especially after Jack Woodcutter managed to escape, having stolen the witch's eyes. His only friend is Betwixt, a chimera also captured by the witch, who's forced to change shape every time the witch does magic, unable to choose his own shape until the witch dies. The two make a wry and humorous odd couple, keeping each other company and trying to foil the witch as best they can. I applaud Alethea Kontis' imagination and creativity and hope she keeps publishing at least a book a year. There are clearly more books coming in this series, and I hope that while sequels possibly also focus on other members of the Woodcutter family, this is not the the readers see of Saturday, Peregrine and Betwixt. I would probably like this one!